Deep purple color. Jammy aromas and flavors of cassis jam, fig paste, chocolate toffee, and herbs with a supple, vibrant, fruity medium body and a smooth, captivating, medium-length finish with notes of black raspberry and cherry, spiced nuts, and creme brulee with light oak flavor. A bright, juicy cabernet with zesty acidity for the table. Bottom Line: A bright, juicy cabernet with zesty acidity for the table. 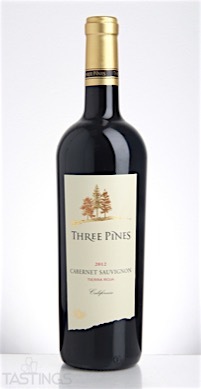 Three Pines 2012 "Tierra Roja", Cabernet Sauvignon, California rating was calculated by tastings.com to be 90 points out of 100 on 9/18/2016. Please note that MSRP may have changed since the date of our review.